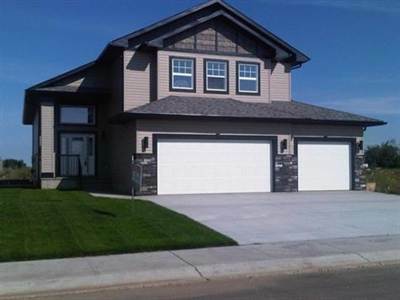 Custom built bi-level with a TRIPLE garage backing onto green space and a brand new park! This beautiful home offers a wonderful floor plan which includes a total of 5 bedrooms! The master bedroom is above the triple garage which enjoys a walk in closet and ensuite complete with soaker tub and shower, double sink and separate area for the toilet. Main level offers 2 bedrooms and a 4 piece bath, a large kitchen with dark wood cabinets, built in spice and wine racks, glass accent doors, huge island and eating bar, pantry and nook which leads to a covered deck. The great room is so warm and inviting with the flow of hardwood floors from the kitchen, a gas fireplace surrounded by built in cabinets to hide all those components and cords! Vaulted ceilings and a wall of windows with a staircase leads to the fully finished basement. Downstairs you will find a family room, 2 bedrooms and a 4 piece bath along with laundry and lots of storage. This home is steps from an 18 hole championship golfcourse! !